Recipe Copyright © 2010 Kasma Loha-unchit. 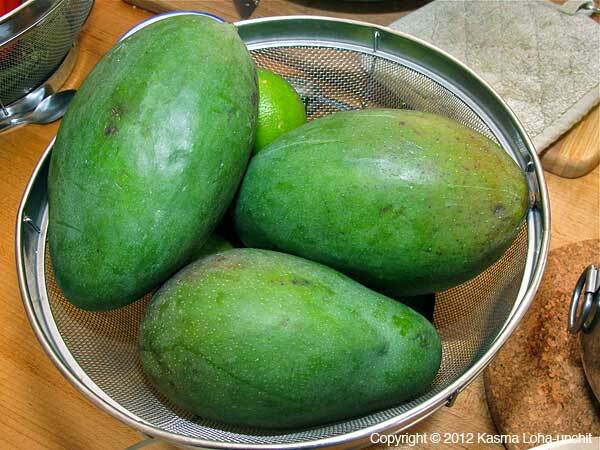 See Kasma's Blog on Green Mango. In Thailand, a hot-salty-sweet dip is made by pounding Thai chillies with sugar and salt until well blended. Various kinds of fruits are dipped in this mixture whether for a snack or following a meal. Among the favorite fruits for this kind of treatment are tart unripe green mango, crisp green guava, acidic pineapple, sour pomelo, jicama, astringent under-ripe gooseberries, and various kinds of crisp pickled unripe fruits. Because tart unripe mangoes are not easy to find, I like to add lime juice to make up for the lack of tartness in the green mangoes found in Asian markets here; so instead of making the salt-sugar-chilli dip, I just toss the mango slices with these three ingredients and the lime juice. 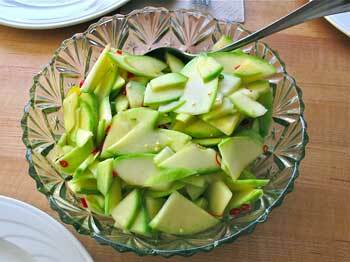 If you can’t find a firm, crisp green mango, try the combination with a tart, crisp green apple. Of course, the apple will be sweeter than the green mango and you probably won’t need to use any sugar at all. Try also on crisp under-ripe plums and nectarines. Be sure to see Kasma's blog on Green Mango. Kasma teaches this recipe in the Evening Series Advanced Set F-1. *Because the Thai language has its own script, there are different ways of transliterating Thai into English. The more phonetic version is Mamuang Yam Prik Gkap Gkleua; the more usual spelling is Mamuang Yum Prik Kap Kleua. See A Note on Thai Pronunciation and Spelling. Recipe Copyright © 2010 Kasma Loha-unchit. All rights reserved.